People from the most deprived areas nearly eight times more likely to need help. More than 24,000 Scots were treated in hospital for alcohol-related problems last year, new figures show. People from the most deprived areas are nearly eight times more likely to need help, according to the NHS. 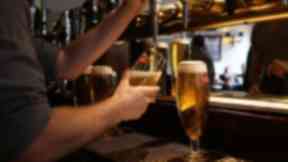 There were 36,235 alcohol-related hospital admissions last year - the equivalent of more than 100 a day. They involved 24,060 individual patients - up from the 35,376 admissions involving 23,656 patients the previous year. Alcohol-related admissions had been falling for almost a decade but the latest figures show there were 685.2 hospital admissions per 100,000 people last year - an annual increase of almost 2%. People living in the most deprived parts of Scotland were more than 15 times more likely to be admitted to a psychiatric hospital because of drinking than people from the least deprived areas. "There continues to be an inequality gap for alcohol-related admissions between those living in the most and least deprived parts of Scotland," the NHS report said. Admissions to general hospitals for liver disease linked to alcohol rose for the fourth year in a row, with 140 hospital stays per 100,000 people recorded. The new figures were published less than a week after Supreme Court judges backed plans for Scotland to become the first country in the world to introduce minimum alcohol pricing. Scottish Government public health minister Aileen Campbell said: "Increasing hospital stays and liver disease are deeply worrying." Despite the figures showing that deprived people are significantly more likely to be affected, she added: "Age, gender and social standing are no barrier to excessive consumption and with alcohol-related deaths rising earlier this year, there has never been a clearer demonstration of the need for minimum unit pricing." Liberal Democrat health spokesman Alex Cole-Hamilton called on the government to reverse "damaging" cuts to drug and alcohol support services. He said "These numbers show that Scotland continues to have an unhealthy relationship with alcohol. "The Scottish Government has belatedly recognised Liberal Democrat calls to reverse their damaging 20% cut to drug and alcohol support services but there is much more to do. "Now we finally have the go-ahead for minimum unit pricing I urge the government to act swiftly and put it into practice as part of a new push to win the battle with the bottle."